"You are not defined by your scars." When a dog looks at you, it's been suggested they're doing so to figure you out. Dog owners know that their pets are a lot smarter than most others would think and they appreciate the same level of care you would give a child. There are some out there though who view dogs less as people and more as entities. 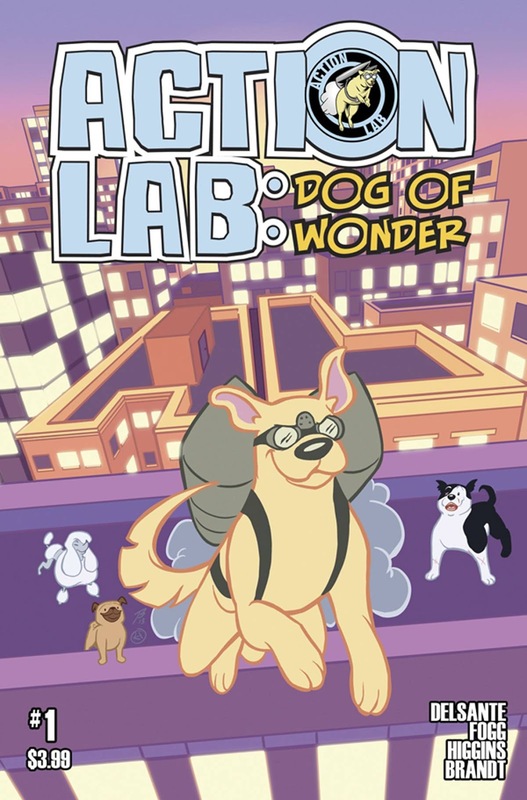 It's those dogs who need help in Action Lab: Dog of Wonder #1 from Action Lab Entertainment. The issue is written by Scott Fogg and Vito Delsante, illustrated by Rosy Higgins and Ted Brandt and lettered by Full Court Press. For five years, readers have looked at the Action Lab Entertainment logo and wondered, "Who IS that dog with the jet pack?" Wonder no more! The story you never thought would be told is now an ongoing monthly title as Action Lab: Dog of Wonder, comes to comic book shelves everywhere. Action Lab: Dog of Wonder #1 offers up a superhero dog with a lot more of a role than the caped dog arguing with the monkey at the Sidekick Lounge. Fogg and Delsante's script is pretty great in this regard, because it personifies dogs as having their own world with their own problems. In fact, Action Lab: Dog of Wonder #1 could exist in a world alongside the recent BOOM! Studios release Kennel Block Blues. Both works give readers a glimpse into dog world problems and Fogg and Delsante quite cleverly pit rescues against the kennels that do the rescuing in Action Lab: Dog of Wonder #1. At the core of the issue is some headier material, in that caring for strays--even with the best intentions--is often a thankless job when the resources aren't there to do so. 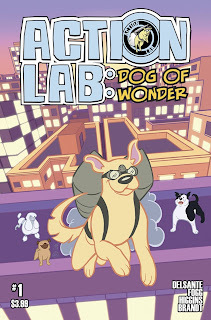 What makes Action Lab: Dog of Wonder #1 feel like an Action Lab title is the extremely airy artwork by Higgins and Brandt. Action Lab himself boasts a look that's all-American and gracious, with Higgins and Brandt emphasizing his presentation as a means of reinforcing the notion that dogs can be regal in their own way. Characters (human and animal alike) are illustrated with simple outlines and generic definition. Higgins and Brandt rely on the simple character models to help underscore the notion that this is meant to be more of an all-ages book and the artwork feels appropriate for such. The colors throughout are also light and boast plenty of pastels throughout, providing a look that's effervescent before anything else. Action Lab: Dog of Wonder #1 is a pretty enjoyable first issue that capitalizes on a fairly simple notion: dogs have feelings to. Action Lab is a character replete with gadgets and confidence to fight what he perceives to be the good fight. Fogg and Delsante don't let the script get bogged down in overly complicated narratives or characterizations. The artwork by Higgins and Brandt is bubbly and a perfect match for the content of the story. Action Lab: Dog of Wonder #1 will appeal to all readers and relies on the notion that dogs should be treated with respect too. Action Lab: Dog of Wonder #1 is in stores now.